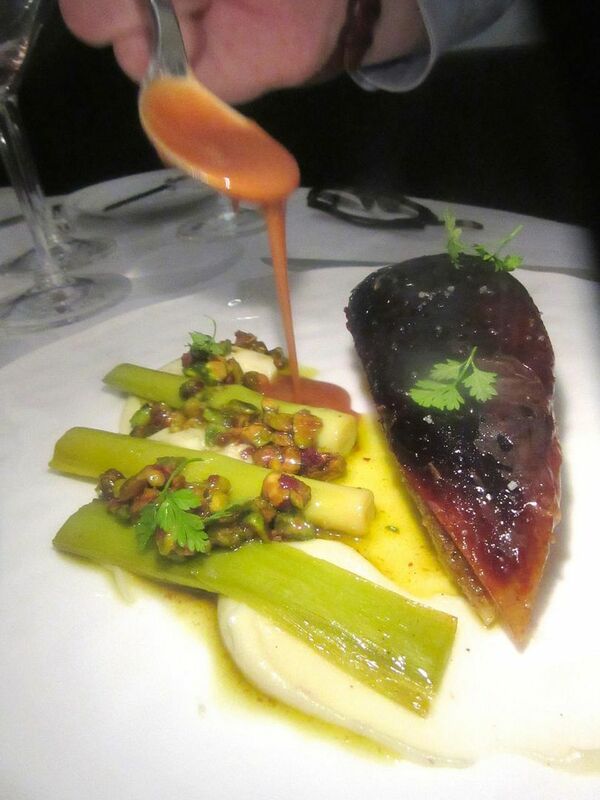 Pistachio stuffed chicken with glazed leeks and foie gras sauce from a February menu. Did he blush? Did he blanch? I sometimes have a debilitating effect on restaurant crews. Did I imagine he looked guilty? “I did that because you’re left-handed,” he confesses. The truth is, I’m so impressed by his initiative that I hesitate to tell him I don’t use the knife with my left hand, doing a cut-and-switch like most of my right-handed pals do. Caviar with buttered toast points and an egg. How’s that for a welcome? 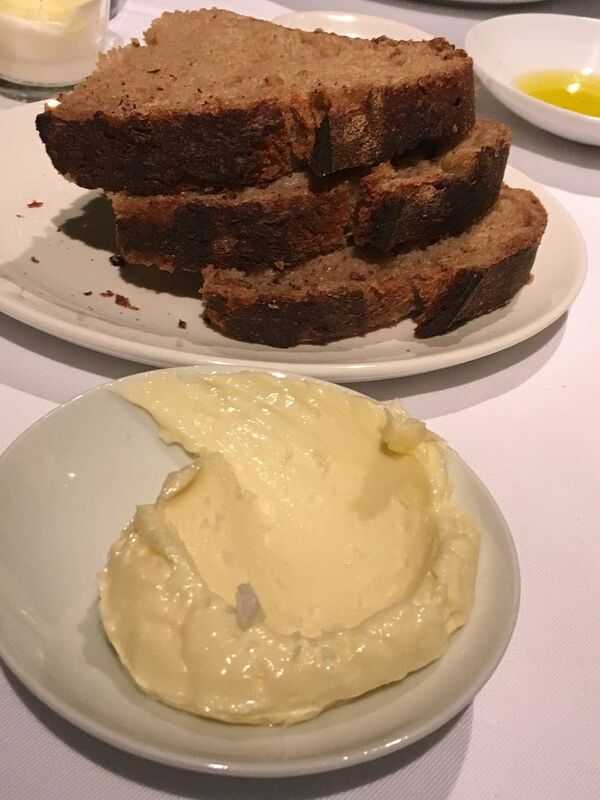 It seems there is a lot of esoteric, super service thought electrifying the gorgeous back room at The Modern, Danny Meyer’s two-Michelin-starred oasis at MoMA. Not every Meyer house lives up to his celebrated reputation for hospitality. But The Modern does. 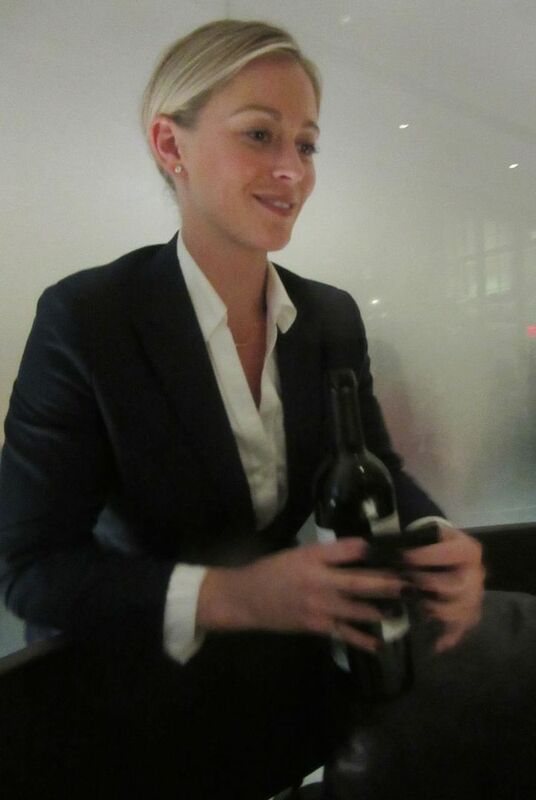 Sommelier Courtney Weiland is about to pour me a glass of Post Scriptum, 2013 Douro. It is surely one of the most elegant places for dinner in New York. The linens are heavy. The service plate has a deep blue center. The crystal anticipates the possibility that your host will ask the sommelier to guide him to an unusual wine from an impressive list. 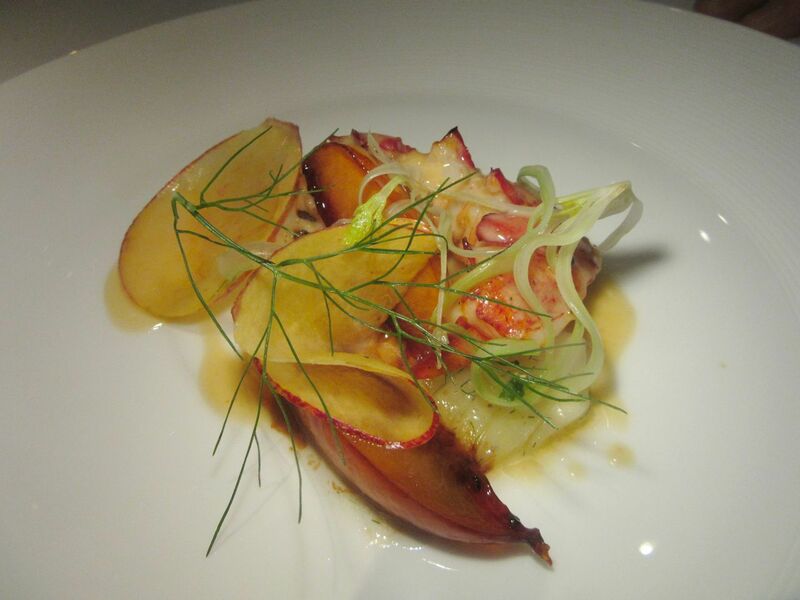 Sweet and tender lobster with furs of fresh nectarine and ginger-braised fennel. Some months ago, four of us had an astonishing meal. 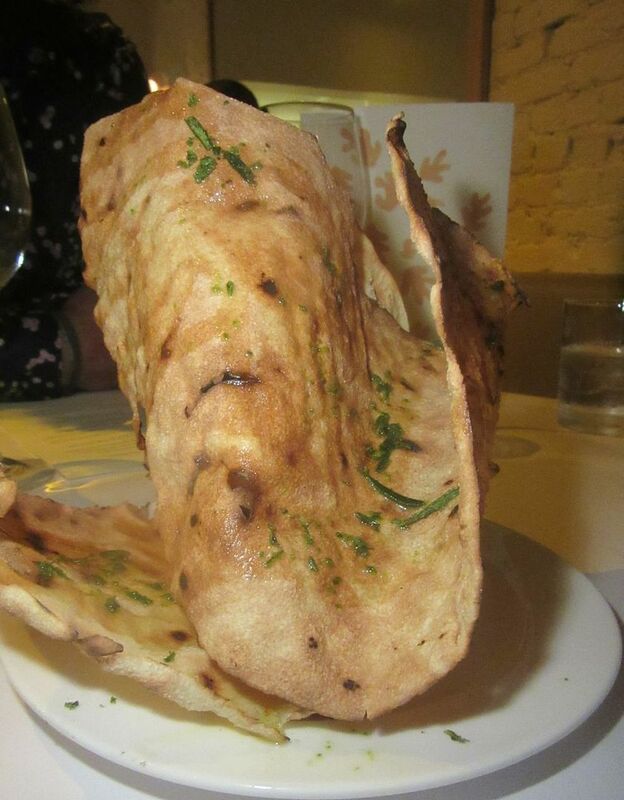 On a more recent evening, a few dishes are less than thrilling, but I’m impressed again by the level of excellence. 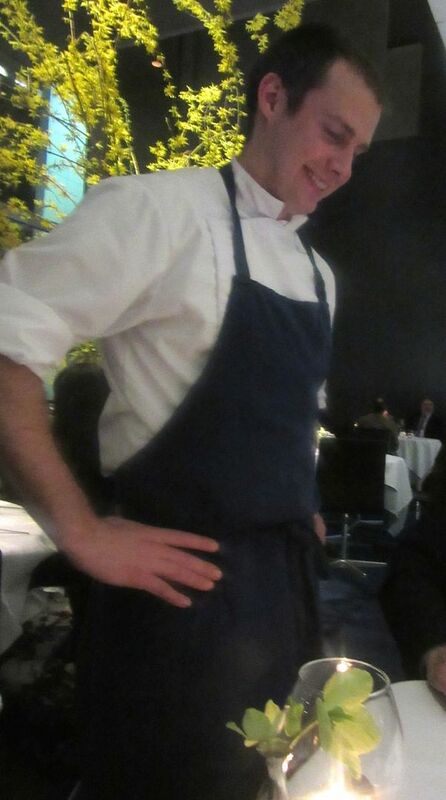 Chef Noah Poses emerges from the kitchen for an introduction and our compliments. 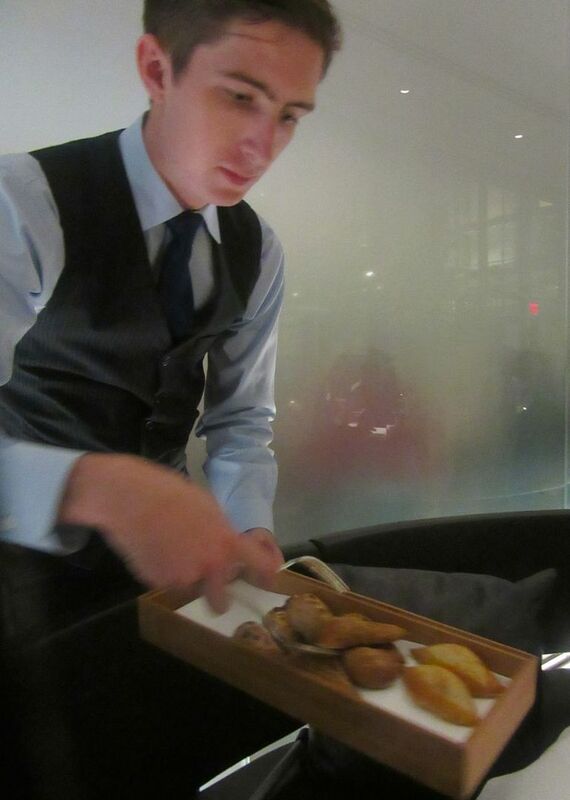 The Modern doesn’t feel the need to be as eccentric as Eleven Madison Park has been, stupefying the bourgeoisie who designate the world’s restaurants each year (grating carrots at the table, card tricks). 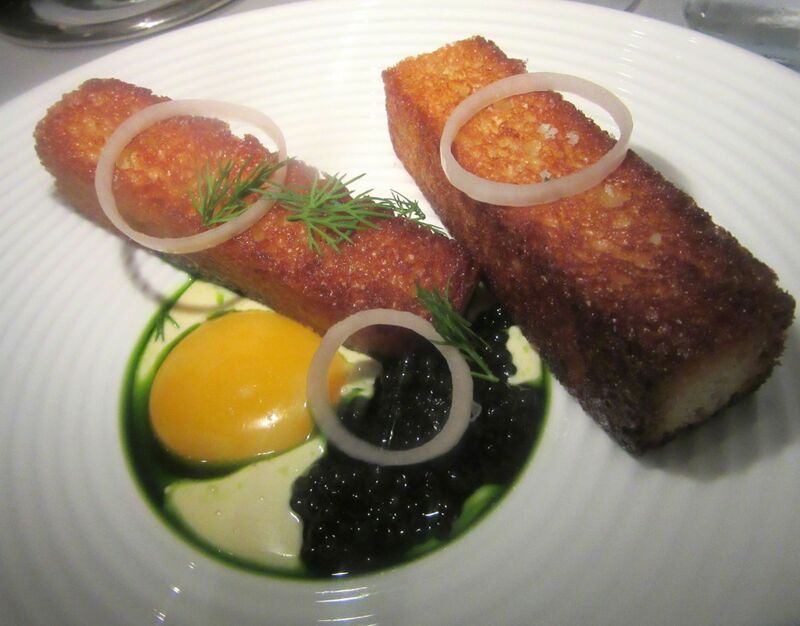 It isn’t clearly ancienne garde like La Grenouille. 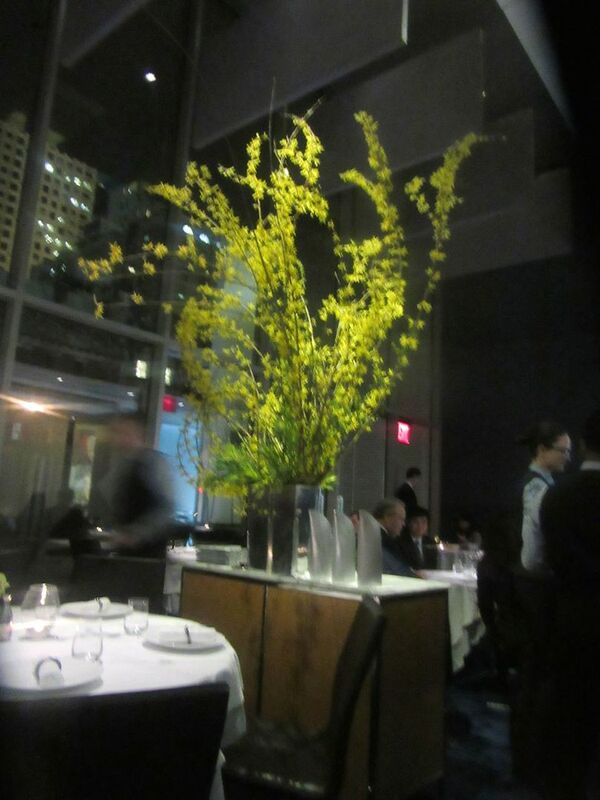 And since Le Bernardin sacrificed its graceful entrance to rows of tight-packed bar tables (no jacket required), The Modern is definitely the winner in majesty of ambiance. Bursts of tall flowers, space between tables and the sculpture garden create a rare ambiance. Monuments of tall flowers sweep toward the ceiling. Until the sun sets you feel you can see the sculpture garden (and sometimes it is lit for private parties.) The small, warmed breads are worth sabotaging a week of dieting. We have chosen the $168 four-course dinner, up $10 from February. The eight-course tasting has increased twenty bucks to $228. Persian cucumbers and pickled green garlic in small onion cups jewel the marinated tuna. On a winter evening, salad of wild lettuce, persimmon and burrata croquant. Chef Abram Bissell --who took over the kitchen in 2014 when Gabriel Kreuther left to open his own place -- works with a unique flavor palette. 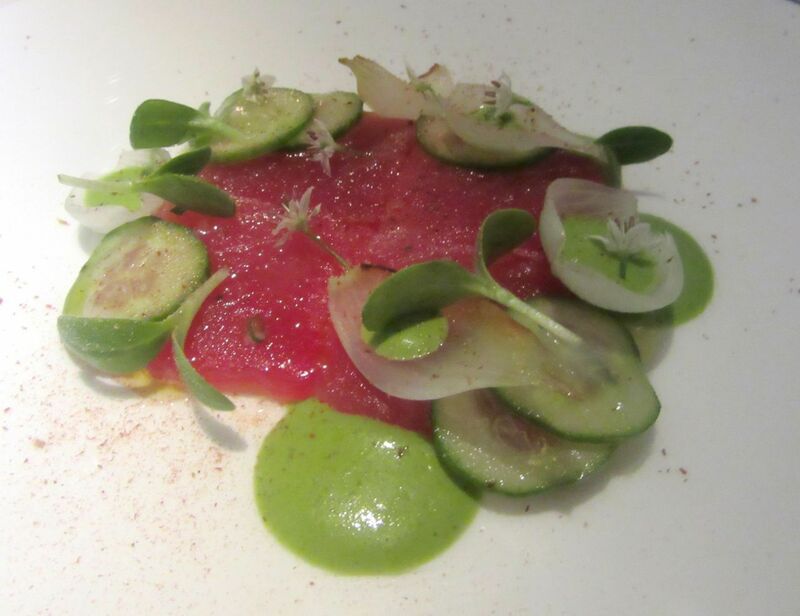 His marinated tuna with Persian cucumber, pickled green garlic, and the umami of bottarga grated on the plate is something you have never tasted anywhere before and are not likely to encounter anywhere else. 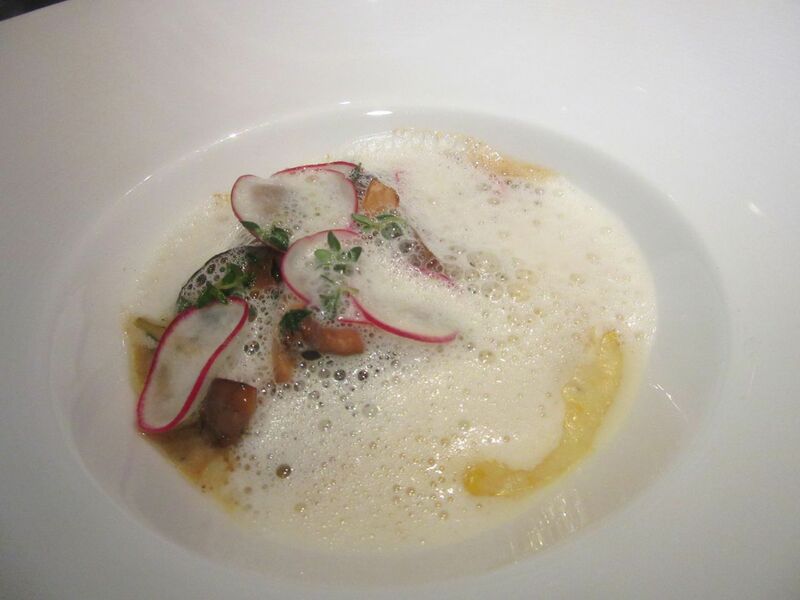 Taking advantage of late summer corn for a fricassee with chanterelles, radish thins and parmesan foam. 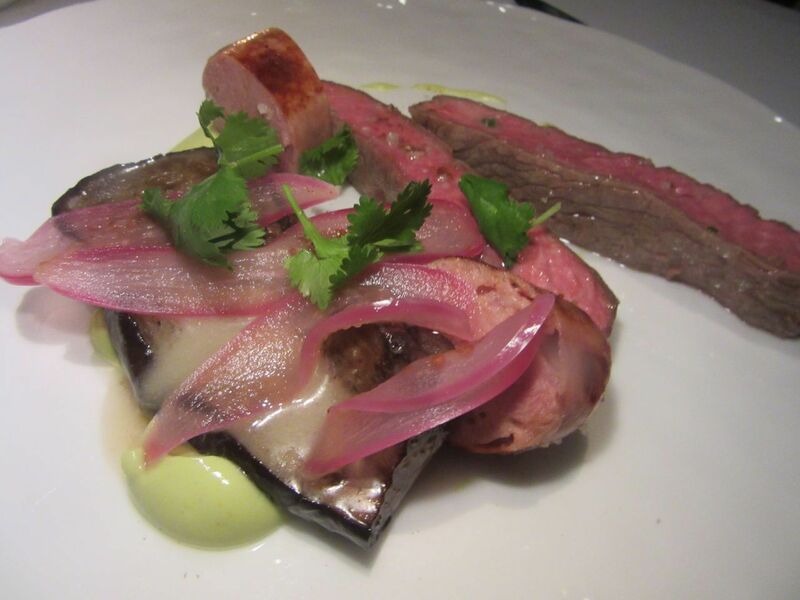 Roasted lamb saddle with lamb sausage, and Fairy Tale eggplant, on sheep’s milk yogurt curry. I eat more than my share of tonight’s sweet corn fricassée with its end-of-summer foam, chanterelle mushrooms and sprig of tiny thyme leaves, before passing it to my tablemates. The green rivulets under the meaty ribbons of rare roasted lamb saddle and Fairy Tale eggplant is a curry sauce enriched with sheep’s milk yogurt. 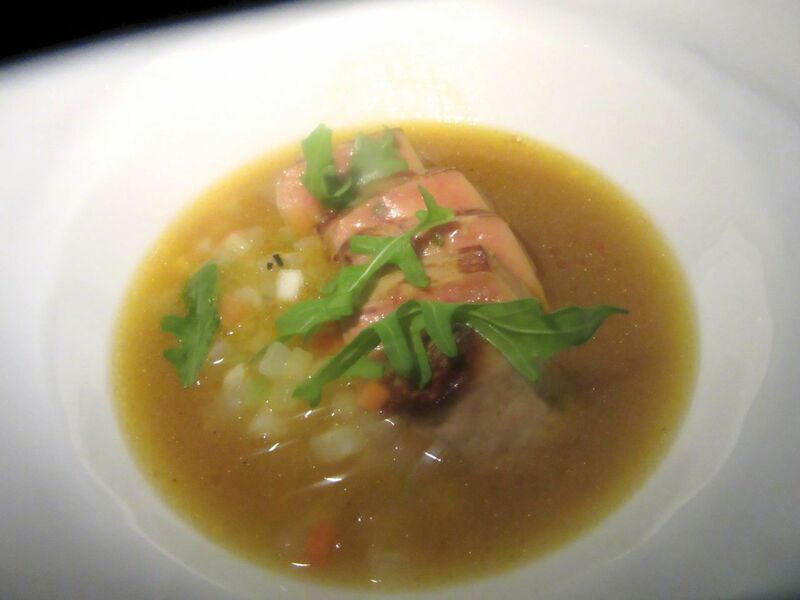 Sauteed foie gras with glazed celery in roasted corn broth, another original whimsy from the chef. The menu never changes at some restaurants. At others your favorites suddenly vanish and you don’t feel drawn to what replaces them. 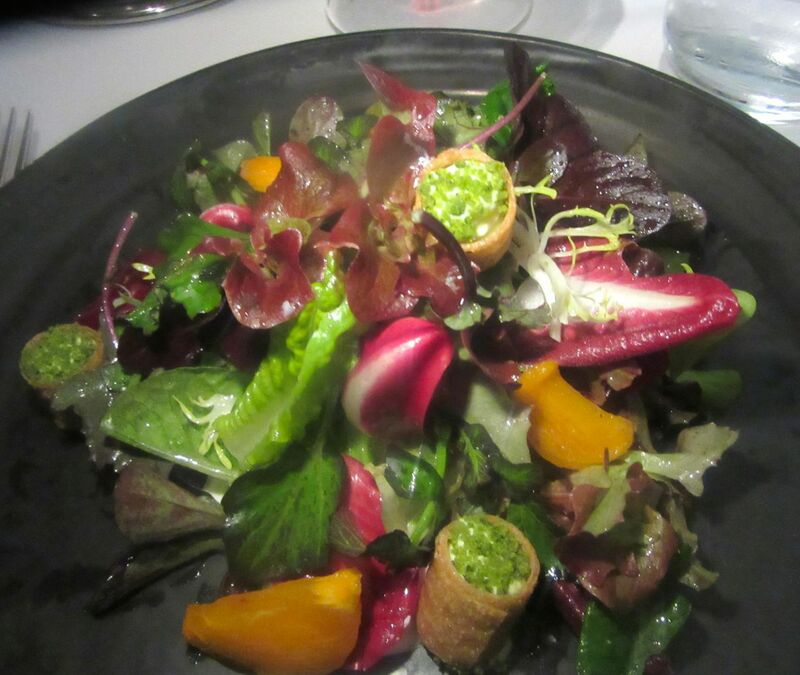 Here, the seasonally changing menu is familiar but always refreshed and newly seductive. 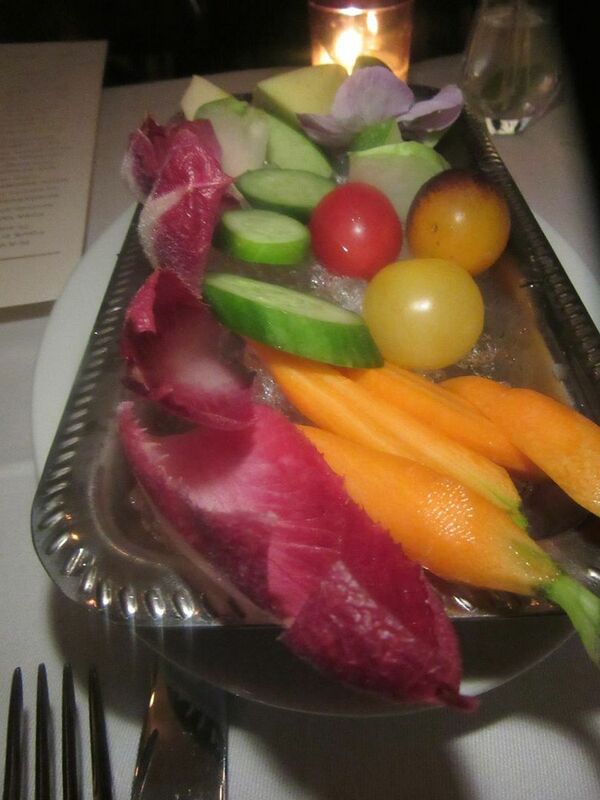 There will surely be a salad, foie gras once or twice, some meatless options, lobster and a chicken dish. But the market dictates, nectarines, heirloom tomato, wild blueberries, persimmon, and the chef’s shifting fancies add surprise. 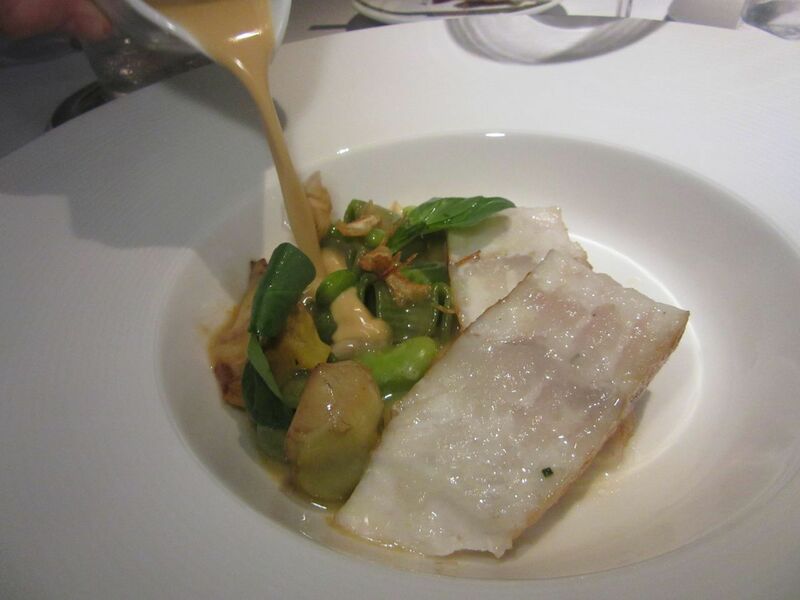 Turbot is roasted on the bone and served with artichokes barigoule and a last-minute pour of minestrone broth. 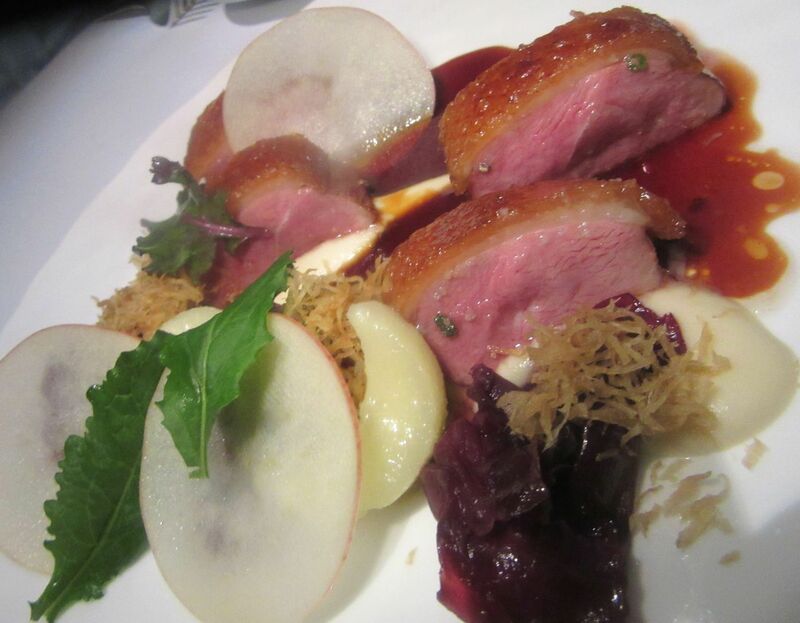 There won’t always be duck on the menu as there was last February, gingered with gala apples and red cabbage. In winter, turbot roasted on the bone might merit a Meyer lemon confit and Belgian endive. In early fall, it can be flanked with artichokes barigoule and get a last minute pour of minestrone broth. Wonderful, in either mode. An olive oil-poached pear and onions dressed in buttermilk may accompany herb-roasted porcelet de lait on a wintry evening. Wild sorrel will be the pork’s foliage in early fall, with a side of pommes rissoles. 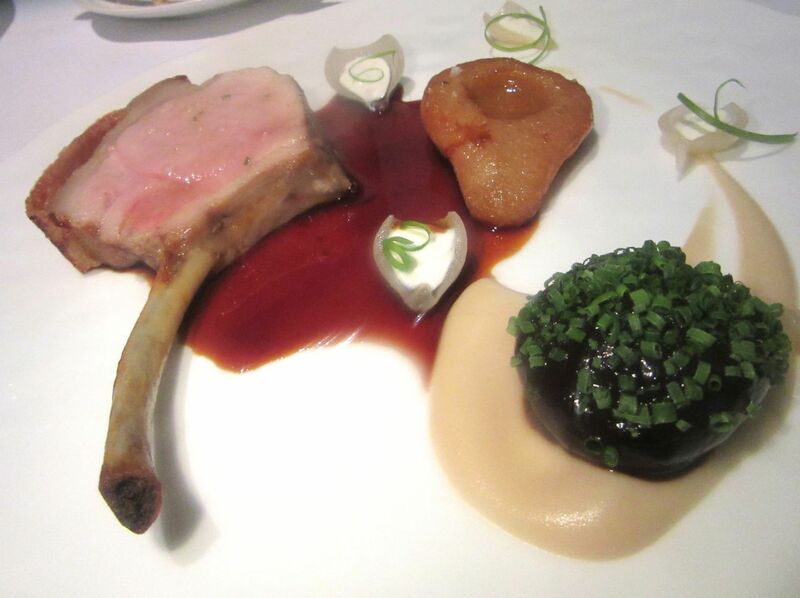 Pork and pear: a classic. A private party of 58 people seems to have discombobulated the dining room team the evening of my most recent dinner. Our wait stretches. But then when the amuse finally arrives, all of us are enchanted by cream of tomato soup with horseradish in a little cup, and a miniature grilled cheese sandwich. I asked for another dinner roll late in the meal and that sent the bread cadet to warm a collection just for me. I long for one of each bread offered by the young man seemingly assigned to that detail. Whole grain, raisin studded, mini baguette. But I don’t want to seem greedy. Later in the evening, eating pan-roasted salmon in a tangy sauce gribiche, decked out with a fan of fried squash blossoms, I find myself consumed by a need for another roll. The bread cadet takes forever. The salmon on its caramelized red wine-fish bone glaze is gone by the time he arrives. 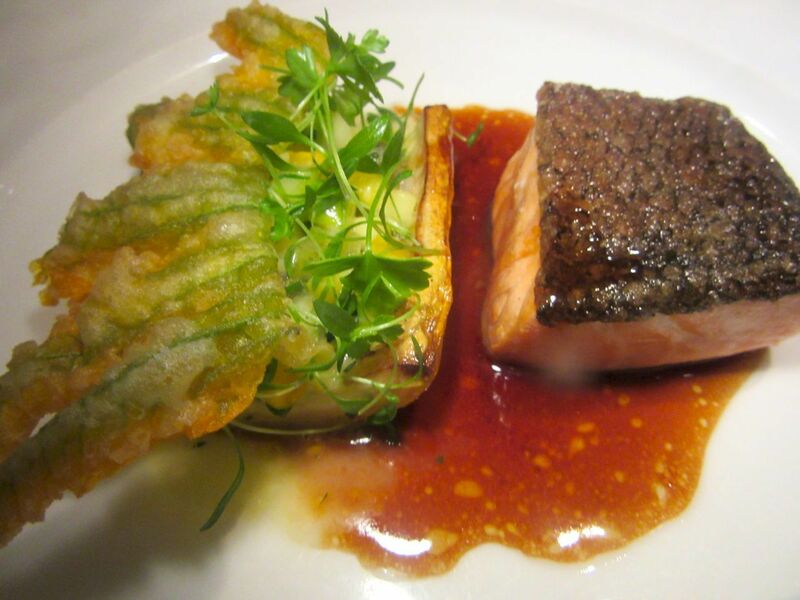 I chose the pan-roasted salmon with sauce gribiche not anticipating a crown of fried squash blossoms. 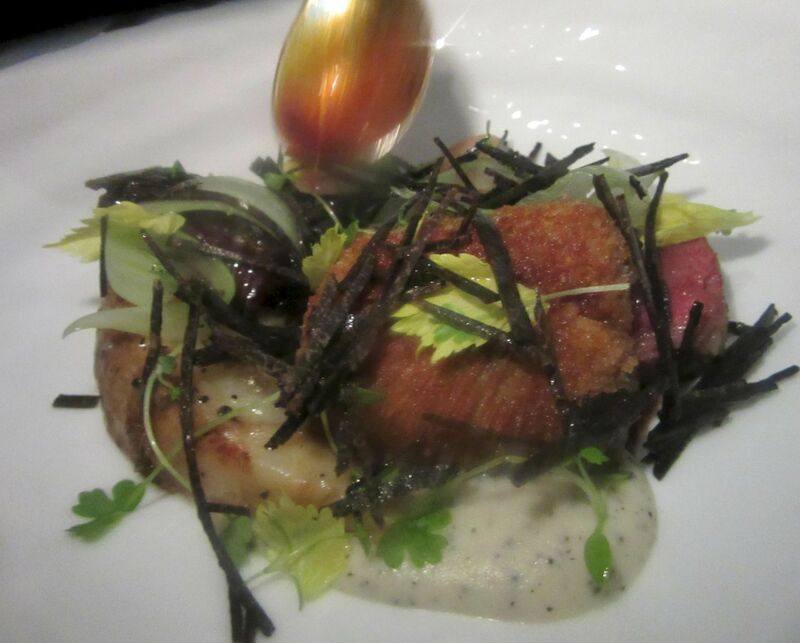 Bone-marrow crusted beef with salt baked celery root and batons of black ruffle from the February dinner. “Why did it take so long?” I moan. He had to select an assortment and warm them just for me, our captain explains. Impressive, I’d say. 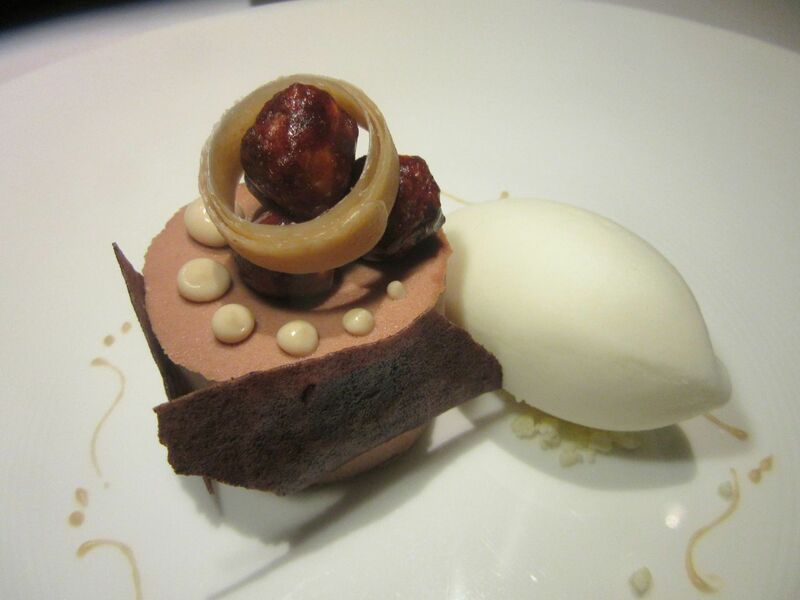 Pastry chef Jiho Kim’s milk chocolate caramel mousse with candied hazelnut and butterbeer ice cream. Meanwhile, I agree with my companion who ordered the tossed salad that its avocado-fromage blanc purée doesn’t relieve how boring it is. The foie gras in roasted corn broth loses something in sautéing. But those small quibbles do not really detract once the crew is dancing attention. 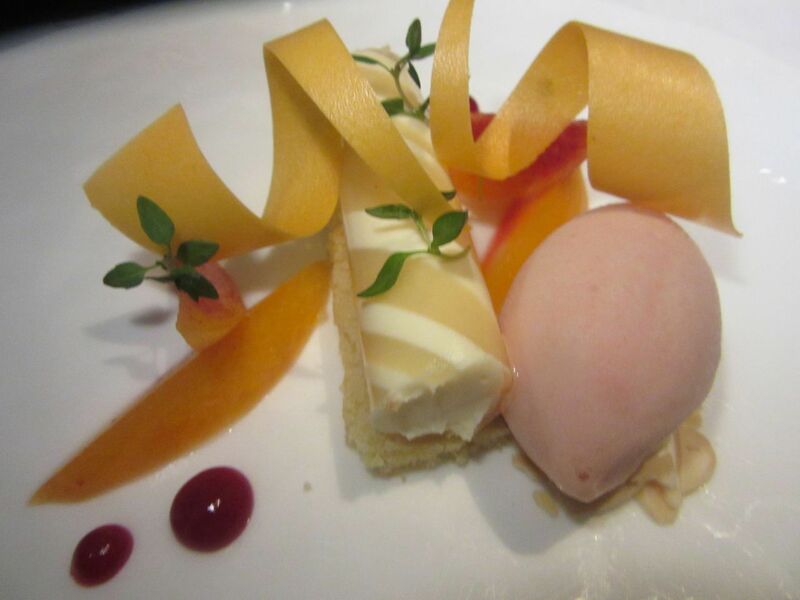 The chevre cheese mousse comes on almond cake with peach tea sorbet. Jiho Kim’s desserts are pretty enough, but not showstoppers like some of Chef Bissell’s delicious ravings. Milk chocolate caramel mousse with butterbeer ice cream and strawberry Romanoff with buffalo mozzarella and root beer leaf ice cream simply satisfy the craving for something sweet at the end. 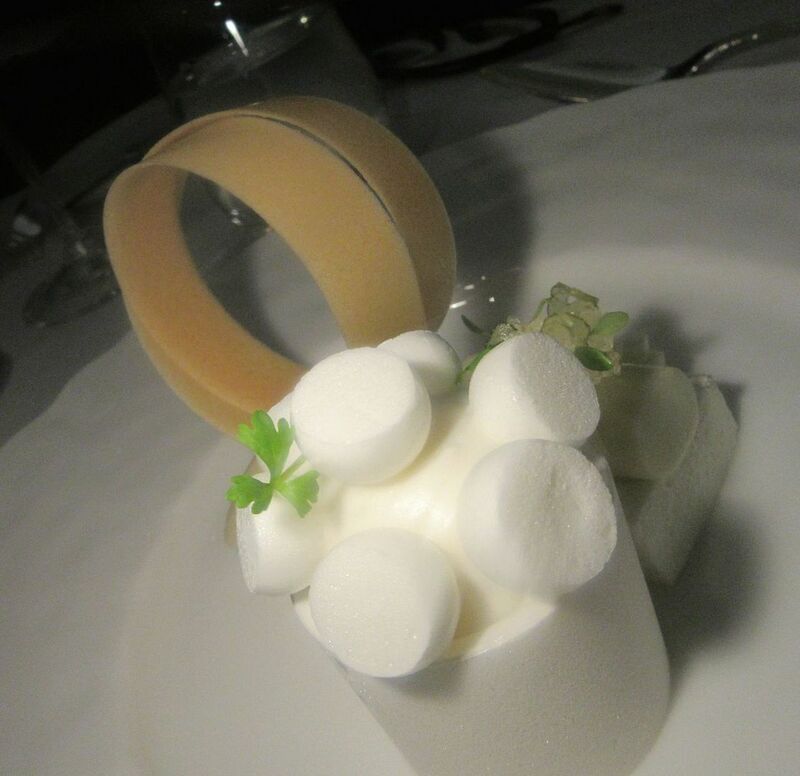 Green apple vacherin with Calvados crème chantilly and angelica ice cream. But on leaving, we pass the impressive cheese cart. We’d been offered cheese as an extra. I wish the captain had told us we could also have cheese as a fourth course in place of a sweet. Next time. Next season. Perhaps I’ll remember when we return this winter. Do I start to complain when I see that my share with drinks is $210.95 at the end? Then I note the farewell message at the bottom of the bill: “hospitality included.” Oh yes. Well…okay. Fair enough. 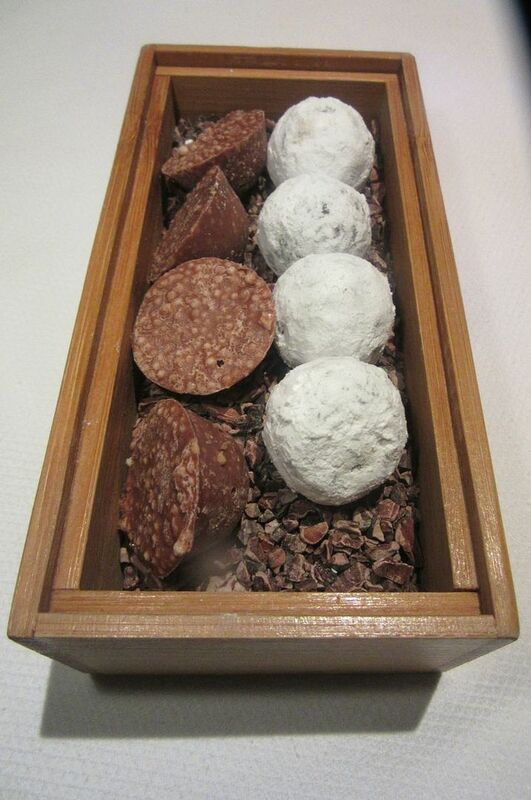 Mignardises at the end might be salted caramel truffles and you-never-know. 9 West 53rd Street on the ground floor of the Museum of Modern Art, between Fifth and Sixth avenues. 212 333 1220. Lunch Monday through Saturday noon to 2 pm. Dinner Monday through Thursday 5 pm to 10 pm. Friday and Saturday 5 pm to 10:30 pm.